of idealistically paced architectures. Outcomes present a palette of possibilities for discerning slow architecture as a paradigm. Grounding in the nature of design enticing postponements, the study explores, construes, and curates possibilities to bring in the advantage of slower thinking, sensing, making, and educating. Universal urges for speed are undeniable. Future of cities may also well remain digital with technologies persisting further impacts on limits and possibilities of all disciplines including architecture. 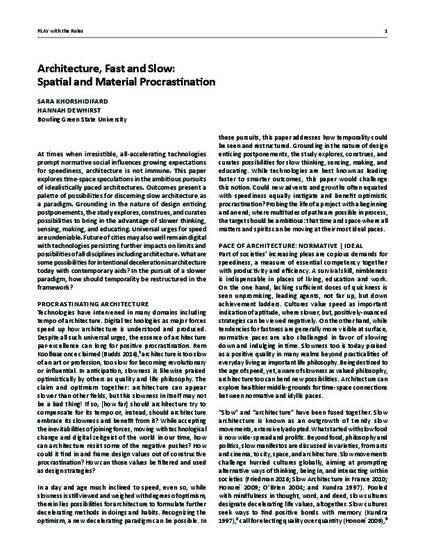 What are some possibilities for intentional deceleration in architecture today with contemporary aids? In the pursuit of a slower paradigm, how should temporality be restructured in the framework?